While he was born Michael Peterson, Britain’s most dangerous prisoner will go to the grave as Charles Bronson, his fighting name. He’s a ball of destruction that ultimately becomes too much for the country’s jails to handle. Strangely enough, this is a man sprung from a fairly affluent middle-class family who had nowhere to go but up. And perhaps that’s one of the movie’s messages – it doesn’t matter where you come from if you have violent tendencies. They will take over you. These violent outbursts land Bronson in the slammer, which hardly calms or rehabilitates him. He sees it like a stage where his violence is his show for a hardly-impressed audience of guards. 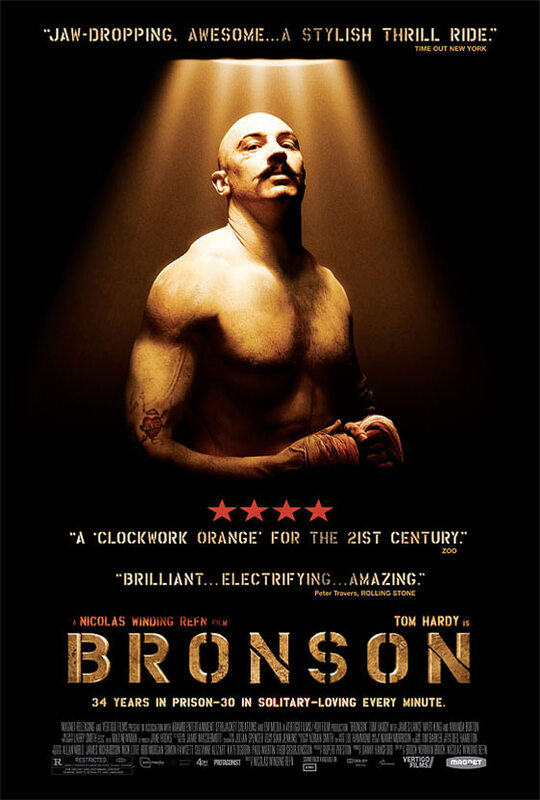 The film perfectly captures the theatrical nature of Bronson’s violence, even spoon-feeding it to those who don’t pick up on it from Hardy’s brilliant portrayal of obsession. Because of this, “Bronson” is more than just your average prison thriller. It’s a portrait of a potentially demented man who will throw a punch no matter what the consequences are guaranteed to get the testosterone pumping through your body. I thought Hardy was great in this, but I found the movie to be rather horrible. Just way too sloppy. I get that the movie is supposed to mirror the character of Bronson, but it just didn’t work for me. Such an excellent film. Better than “Valhalla Rising” and “Drive,” as far as I’m concerned – and I enjoyed both of those films. Refn really shined a light on how talented Hardy is here and I’m glad “TDKR” is giving him even more exposure. Haven’t seen “Valhalla Rising” but not encouraged by Netflix’s predicted 2-star rating for me. Hardy was fine in TDKR but he’s a boss in “Lawless.” I can’t wait for that to be unleashed on theaters.